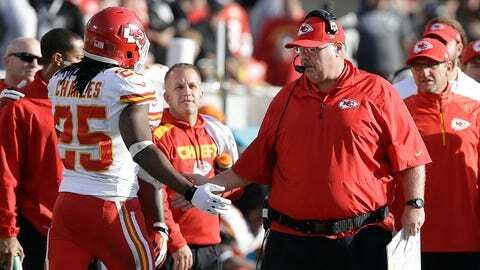 Don't look for Andy Reid to rest Jamaal Charles against the Colts, or to keep anything in his bag of tricks if he needs it to win Sunday. "I don’t think you do," Reid said Monday. "We’re far enough in the year where you have enough in the playbook on both sides of the ball and in special teams to play it normal. I don’t think there’s any reason to (hold back), plus the season is still alive. "You give it your best shot. It’s what I told you when we played Denver. We played them, gave it our best shot. Then you play them again (in two weeks) and you give your best shot again. That’s how we approach it." "I guess it does," Reid said. "(But) this team is wired a little different. I never sensed at any time or heard them talk about, ‘Hey, New England won or lost’ or ‘Miami won.’ I haven’t heard any of that going on. "I think they’re going to finish out strong no matter what (the standings are). As a coach, you tell them to ‘Go get ’em’ and they do that. They’re wired that way." "We got him to wear a couple of pairs of socks to finally heal up," Reid said, smiling. "He takes great care of himself. He’s got a routine he goes through every day. As you know, that’s a demanding position." "We’re comfortable with the way guys are healing up," Reid said. "We’re not forcing anyone into a game that isn’t ready. "So if a guy can play, physically, he’ll play. We haven’t put guys in a position to reinjure themselves. That’s not how we roll. "The rest of the season is just as important to us as the beginning of the season was. We’re not (holding) anything back here." "It’s just about refocus. You see this in baseball and the NBA, and it’s the one thing that kind of carries throughout these sports — it’s that a team gets a big lead and there’s always one push back. And then if you can kind of shut that push down, you got it. "I thought Oakland did a heckuva job and they made that push, and then we put the clamp down. That’s important."